K&L Filter Wizard® is a filter specification and selection tool provided for the convenience of K&L's customers. Due to manufacturing variations, actual performance is not the same as theoretical response. Please see disclaimers pertaining to Filter Wizard designs. K&L Microwave designs and manufactures filters with all-pole bandpass, lowpass, highpass, and band-reject responses and elliptic and pole-placed bandpass, lowpass, highpass, and band-reject responses. Available multi-port devices with more complex responses include diplexers, multiplexers, and switched filter banks. This release of the Filter Wizard selection software treats all-pole and elliptic bandpass responses, all-pole and elliptic lowpass and highpass responses for lumped components, and band-reject responses for cavity products. K&L Microwave's broad range of product types includes Dielectric Resonators (including KeL-fil® brand filters), Lumped Components (including KeL-com® brand filters), Mini-Max® brand filters, Cavity Filters (combline and interdigital, including Mini-Pack® brand filters), Waveguide Filters, Suspended Substrate/Stripline Filters, Tubular Filters, Coaxial Combline (Base Station type) Filters, Tunable Filters, Diplexers, Multiplexers, and Switched Filter Banks. Please visit K&L's product page for more information. The Filter Wizard selection software currently selects from among available solutions in the Dielectric Resonator, Cavity, Lumped Components, and Waveguide product lines. Surface mount cavity products are being added at this time. Several other product types, including Suspended Substrate/Stripline Filters, are planned as future additions. 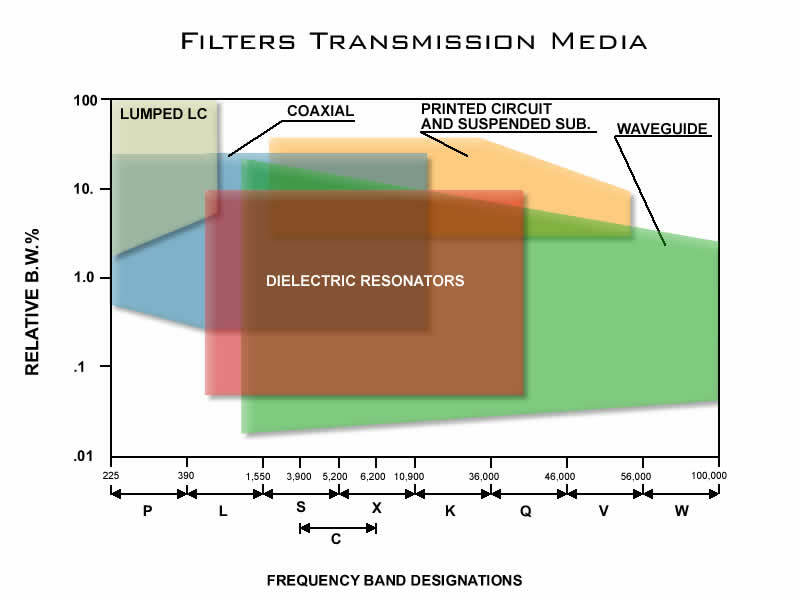 Together, the available product types span a wide variety of frequencies and bandwidths.